Welcome to Lousig-Nont & Associates, Inc.
1. Make a new folder on your C drive, name it either Phase II Profile, or Sales Success Profile, depending on which program you wish to run. You do this by clicking on MY COMPUTER on your desktop, LEFT CLICK on the C drive, go to the upper left hand corner of your screen and LEFT CLICK on FILE, select NEW, FOLDER, and name the folder. 2. Click on one of the links below to download the zipped file, either sspzip.exe or p2pzip.exe into the appropriate folder which you made in STEP 1. 3. After the download is complete, find the file you downloaded using MY COMPUTER, clicking on the "C" drive, and opening the folder you downloaded the file into. 5. In this folder you should now see 11 files including the zip file. Find the file, SETUP.exe, and double click on it. This will begin the installation of the program. 6. Upon installation you may get the error message AUTHORIZATION NOT PRESENT. Simply click OK to continue. 7. You should be presented with a site code to authorize your program for use. Call 1-800-477-3211 ext. 14 to receive your authorization code. 1. Make a folder named test under the directory of your program folder, either Phaseii or ssp. 2. Click on the CRC Error File Check link above and download the file, crcerror.exe into your test directory. 3. Go to Windows Explorer and find the file, crcerror.exe double click on this file and it will unzip files inside the test directory. with the example.ckn file you find inside of your test directory attached. 6. Also include in your email the Site code that was generated in the screen above. 7. We will get back to you with an authorization code. 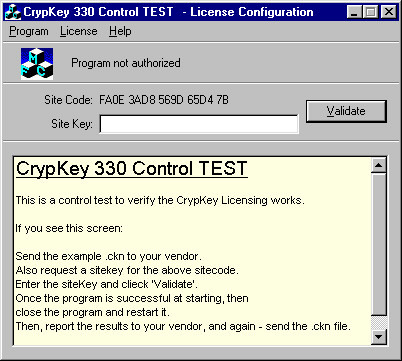 Once you enter the site code and validate it, and the program is successful, close the program example.exe. 8. When you have done this call us ! 1-800-477-3211 ext. 14. 9. We will want you to once again find the file example.exe and double click on it again. We will want a report on what the results are, and we will want you to once again email us with the example.ckn attached. 10. We are sorry this seems so convoluted, but it is the only way that we can analyze what is going on with your computer and why you are getting the CRC error. It may because of a virus, or a virus program you have running in the background that you are unaware of. This will help us isolate the problem and correct it.